Sat, April 13, 2019 12:00 P.M. PLEASE NOTE THE TIME CHANGE: This program now starts at 12:00 PM. Programs start at 2:00 PM [except 4/13 at 12:00 PM], and musicians at any skill level are welcome! 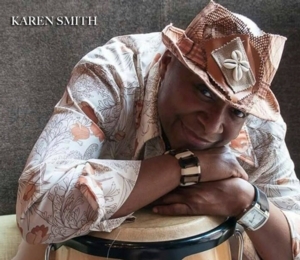 Karen Smith is lead percussionist and artistic director for Weez the Peeples Collective & Sistahs Laying Down Hands, an all-woman percussive poetry, storytelling, dance and drumming troupe. Her play Legacy 2: Where are the Tubman's? Premiered in Rowan University in March, and Library patrons might also know her for her work on the popular Mysterious Travelers concert series. Accessability: A wheelchair ramp is located at the Library’s Wood Street entrance, and a public elevator is located next to the building’s northeast courtyard.